What I Love About TAEA: The main thing I hear from teachers is that conference reinvigorates their commitment to teaching. As a retired teacher / administrator, it helps inspire me to continue my mission to educate through the arts. In my teaching career in the inner-city, I found so many opportunities for my "kids" to broaden their expectations because of their education in the arts. Donna and I are thrilled to report some exciting NEWS for Retired Art Teachers! It's been a busy year, but here's what we as a group, have accomplished. Most importantly, we have a "New Title"! 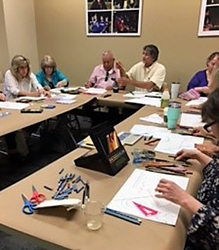 After several years of interest, the membership of TAEA recently voted to officially make the Retired Art Teachers Advocacy Group, a "Division". We want to thank the entire membership for your votes! As you know — if you are reading this — we are now located under the DIVISIONS navigation menu on the TAEA website. Please pass on this information to your friends who are retired, or making plans to retire soon! Another fun addition happened this past June. 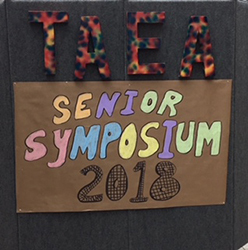 We held our 1st TAEA Senior Symposium at Blinn College in Brenham, TX. As you know, when a group of art educators get together, it is always an adventure! 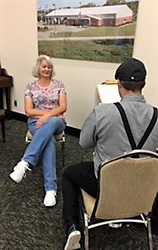 The symposium offered a variety of motivational and fun activities for our "Retirees", "Soon to be Retired", or "Thinking about Retiring" folks. We want to take this opportunity to thank all our presenters: Jami Bevens, Suzy Green, Walter Holland, Ricia Kerber, Nick McIntyre, Sarah McIntyre, and Doug Peck. A very special "Thank You" goes out to Mel Basham and Robert Parker for coordinating and working hard to make this a successful kick-off for our Senior Art Symposium. Plans are already in place to make this an annual event! Attention! Start making your plans to attend 2018 TAEA's Annual Conference, November 8-10, in McAllen, TX. Check the Conference webpage for details, which will include a "Special" Retiree Membership and a reduced "One Day" registration fee. Hopefully, you will be able to attend the whole conference, but just in case you can only attend one day, Janice and I will be holding our "Retired Teachers Division" meeting on Saturday, November 10 from 1:00-1:45 pm. 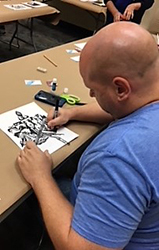 In past presentations, we have had various members of our group — those who have gone from full-time teaching to full-time creating their own art — discuss this transition. We will also discuss how we can help make TAEA offerings more relevant to the entire membership. We do try to have a little "something" of interest for everyone and you are an important piece of our future in TAEA. 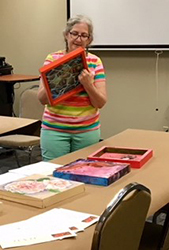 We would like to invite you to be a part of what retired educators are aspiring to be — TAEA's most valuable asset. So bring another Retiree and join us for all the fun in McAllen! For questions or concerns, please don't hesitate to email either one — or both — of us at the email addresses at the top of this page. We hope to see you there!